No one knows for sure what President-elect Donald Trump and congressional Republican leaders are going to do about repealing and replacing the Affordable Care Act when they take power in January. But that isn't stopping everyone from speculating non-stop and offering advice. Neither does anyone know whom the mercurial Trump will select for his administration's top health posts, though that hasn't prevented people from floating names like former GOP presidential candidate Dr. Ben Carson and former Louisiana Gov. Bobby Jindal. “The only person making these choices is Donald Trump, and he's got other things on his mind,” said Tom Miller, a resident fellow at the conservative-leaning American Enterprise Institute. He predicted Trump will make his choices based on a tradeoff between loyalty to him and knowledge and competence in healthcare. “The pedigreed veteran Republicans have kept arm's length from him, and then there are wannabes who don't necessarily have the horsepower to do the job,” he said. Some analysts predict Trump and the GOP-controlled Congress will ram through a top-to-bottom repeal bill almost immediately, then later push through some type of replacement bill resembling House Speaker Paul Ryan's Better Way healthcare reform outline. Ryan's plan would replace the ACA's individual mandate, exchanges, premium subsidies, essential minimum benefits, and Medicaid expansion with conservative features including tax deductions, health savings accounts, and cross-state sales of health insurance. Others say the Republicans will realize how politically risky it is to completely uproot the ACA, potentially tossing 20 million Americans out of coverage, and instead opt to tweak the ACA while calling it repeal. 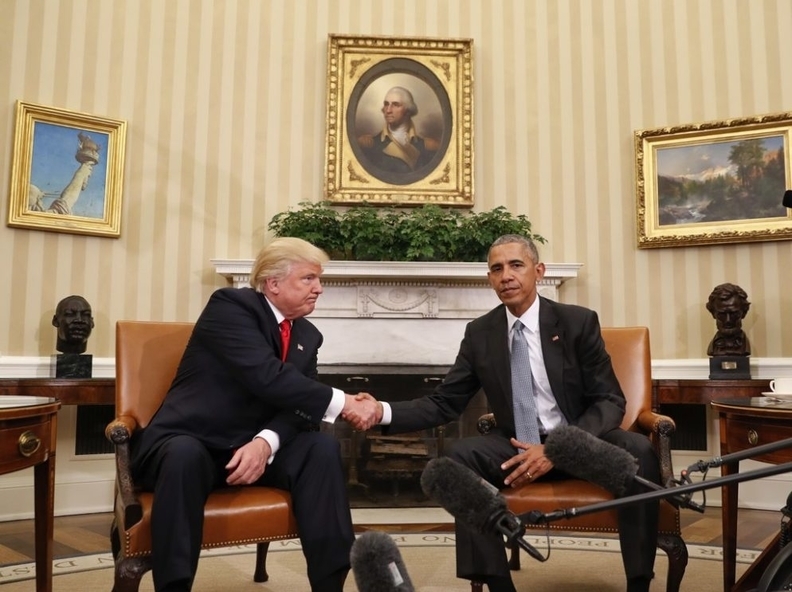 Trump himself offered a hint of compromise Friday when he told the Wall Street Journal that President Barack Obama had convinced him during their meeting Thursday to keep the ACA's prohibition against health insurers denying coverage based on pre-existing medical conditions. Obama also persuaded him to continuing allowing parents to keep their children on their health plans until age 26. “I like those very much,” he said of the provisions, adding that he would consider the president's other suggestions for parts of the law to keep. “Either Obamacare will be amended, or repealed, or replaced,” he said. Still, that's not terribly instructive to those of us trying to read the GOP tea leaves, especially since policy wonks know that it's difficult or impossible to maintain the pre-existing condition ban without also keeping the individual mandate requiring everyone to buy coverage, which Republicans seem determined to eliminate. I got a sense of the fascinating conversations – and contradictions -- going on inside Republican policy circles when I listened in on a Leavitt Partners webinar Thursday featuring the consulting firm's founder and chairman Mike Leavitt, former Republican governor of Utah and former HHS Secretary in the George W. Bush administration, and a number of his colleagues. What struck me was how cautious, even nervous, they are about taking on the enormous task of re-reforming the U.S. healthcare system. They clearly were torn between the political pressure for speed and the policy imperative to go slow and get it right. They also recognized that hasty moves to unravel the ACA, which Trump called a “catastrophe” during the election campaign, could hurt Republicans politically by creating chaos in the individual insurance market. Pointing to the “fragile nature” of the individual market, Leavitt—sounding a little like Democratic presidential candidate Hillary Clinton—said “there are things we can repair that will restore actuarial soundness,” such as tightening the rules for letting people buy coverage outside the annual open enrollment period. Vince Ventimiglia, Leavitt Partners' vice chair, said congressional Republicans don't want to “make the same mistake as Democrats made” in passing the ACA with no support from across the aisle. “They're saying we don't want to pass a RepublicanCare bill that… falls apart and we get blamed,” he said. So they hope to attract at least some Democratic support, “to inoculate themselves so everything isn't on them” following the ACA's repeal and replacement, said Clay Alspach, a Leavitt Partners principal. Liberal health policy analysts say such Republican talk offers hope that the ACA can be modified through compromise legislation, adding some conservative features while preserving the law's coverage expansions through the exchanges and Medicaid. “The very fact that the GOP is thinking this way is a sign of seriousness,” said Lawrence Jacobs, an expert on healthcare politics at the University of Minnesota.